Music is one form of art and is integrated with human culture from time immemorial. Music has great effect on our brains. Listening to the music of various forms can give calming or soothing effect, reduces anxiety and sadness, and improves the quality of life. A number of researchers and studies have explored the role of musical therapy in the management of patients with traumatic brain injury (TBI).,,,,,,, Indian music comprises various ragas. Raga is a music structure which has a set of rules and specific musical notes. These rules and notes are specific to each raga. Due to this, the ragas can affect the mood or emotion, cognition, attention, memory etc., of a person. Acquired brain damage can be due to blunt trauma or secondary to surgery. Patients who had undergone cerebral surgeries often suffer from emotional disturbances, depression, agitation, poor quality of life, poor participation in communication due to aphasia, and at times sleep disturbances. Knowing the positive effects of music helps us to provide a comprehensive treatment to patients along with standard medical and rehabilitation care. Music was introduced in rehabilitation of head injury individuals at the time of World War II and its practice increased in Western hospitals thereafter., The aim of the present study is to know the effect of musical therapy in postoperative cerebral surgery patients. A prospective study was conducted on patients who had undergone surgery for various cerebral etiologies in the Department of Neurosurgery of Narayana Medical College Hospital, Andhra Pradesh (India). Patients who are above 18-year-old and having moderate-to-severe brain damage were considered for musical therapy. 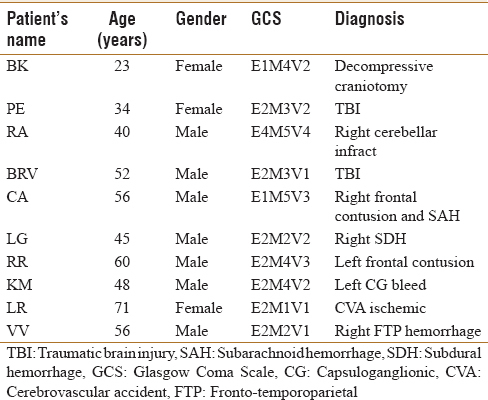 Severity was decided based on Glasgow coma scale (GCS) score. A number of ten patients were selected for musical therapy. Details of the patients are listed in [Table 1] and [Table 2]. All the selected patients were given South Indian classical instrumental music using mp3 player with earphones thrice a day. The volume of the music was kept at constant level throughout all sessions, and volume was lower than normal conversation level (on 1–15 level volume was set at 3). Three ragas were selected; Hindola, Todi, and Kalyani. Hindola was given in the morning, Todi was given in the afternoon, and Kalyani was given in the evening.,, Hindolam is a carnatic ragam and is a audava ragam means pentatonic scale. It is a janya ragam (derived scale) and does not possess all seven swaras (Sa, Ri, Ga, Ma, Pa, Da, Ni). Thia ragam is usually soothing to listen. This ragam is symmetrical in ascending (arohanam– S G2 M1 D1 N2 S) and descending (avarohanam– S N2 D1 M1 G2 S). Due to the symmetrical nature of arohanam and avarohanam, this ragam is improvized very well and commonly used in concerts. Hanumatodi ragam is popularly known as Thodi ragam is a carnatic ragam and is one of the common ragas used in music concerts. This is a melakarta ragam (parent scale) and difficult to perform due to its notes and intonation. The arohanam structure of this raga is S R1 G2 M1 P D1 N2 S, and avarohanam structure is S N2 D1 P M1 G2 R1 S. Kalyani ragam is a carnatic ragam and is melakarta (parent scale) ragam having all seven swaras. The word Kalyani means, she who causes auspicious things and is usually performed in the starting of the concert. The arohana structure of this raga is S R2 G3 M2 P D2 N3 S, and avarohana structure is S N3 D2 P M2 G3 R2 S.
These ragas were given time specifically because, in that particular time, each raga is more effective and all ragas are known to evoke calming/soothing effect. Each session of the music was 30 min in duration, and music experience was given for a week, three times in a day. Heart rate, systolic blood pressure (SBP), respiratory rate, pupillary movement, and motor activity were considered as variables of interest to identify the effect of musical therapy. Effect of musical therapy was estimated as change between pre- and post-session values. Prerecording values of vital parameters was considered as baseline recording. To avoid bias in data collection, vital parameters were recorded by ICU nursing staff (who was changed in 3 shifts). All participants were observed for three times a day for subsequent 7 days. 21 readings for each patient, like these 210 observations of 10 participants were summarized. Changes in study variable observed after musical therapy were expressed in percentages by assuming denominator of 210 observations. Statistical computations were performed using SPSS version 24.0 software for Mac. Changes in variable under consideration were estimated in terms of percentages. Overall unit increase as well as decrease in study variable in mentioned separately. Ten patients with 9 males and 1 female were selected for the study on the basis of GCS scores. The average age of participants was 48.5 years (23–71). Among five study variables, motor activity and pupillary movements were qualitative responses; hence, excluded from further consideration of this study. Changes are heart rate, respiratory rate, and SBP were represented in percentages to total of 21 (3 session/day for consecutive 7 days) reading of each of ten participants. Change in heart rate was observed in 162 (77%) of responses while 48 (14%) responses were not changed and remained missing. Mean unit change recorded in heart rate after music therapy was 0.92 units, which was analyzed separately for increase and decrease response in pre- and post-music therapy. On an average, 5.20 units heart rate was came down while in remaining patients, it was found to be increased by 6.20 units. One hundred and thirty-three (63%) responses of SBP were found changed after music therapy while 77 (37%) were either not changes or remained missing. Mean unit change recorded in SBP after music therapy was 1.36 units, which was analyzed separately for increase and decrease response in pre- and post-music therapy. On average, 9.10 units SBP was lowered while in remaining patients it was increased by 10.95 units. One hundred and thirty-five (64%) responses of Respiratory Rate (RR) were changed, and 75 (36%) were not changes or remained missing. Mean unit change recorded in heart rate after music therapy was 0.13 units, which was analyzed separately for increase and decrease response in pre- and post-music therapy. On an average, 3.00 units respiratory rate was came down while in remaining patients, it was found to be increased by 4.22 units. Pupillary response and Motor activity: Being qualitative values, changes in both of these responses were not found to be changing for majority of cases (83%). For remaining, 17% these both responses were missing, and hence, not considered for further calculation of the study. Koelsch  in his extensive works on music perception and musical therapy reported some scientific perspective of musical therapy. He reported that five factors which contribute to effect of musical therapy. They are attention modulation, emotion modulation, cognitive modulation, behavior modulation, and communication modulation. Attention modulation: Due to the presence of music, person's attention will be diverted easily from negative feelings such as depression, sadness, anxiety, etc., Thus, it gives benefit. Emotion modulation: Neuroimaging studies showed limbic and paralimbic systems are involved in emotional changes. As the music has the ability to evoke and change emotions, it will be useful in the treatment of pathologic anxiety, posttraumatic stress disorder, and depression. Cognitive modulation: Analysis of in terms of decoding the syntax and semantics in the music helps in the long-term care of patients of Alzheimer's disease. Behavior modulation: This includes evoking and conditioning of behaviors such as physical movements by stimulating the premotor cortex. Communication modulation: Music helps in training nonverbal communication skills through active music therapy, where patient makes music and is used extensively for disorders such as autism, attention deficit hyperactivity disorder etc. There is a limited research about scientific findings of the effect of musical therapy in head injury patients in the Indian context. Indian classical music ragas are known to work wonders on emotions. There are various ragas for each kind of emotion. For example; Natta Bhairavi and Revathi ragas associated with fear, doubts, and suppressed feelings. Ananda Bhairavi and Mohanam ragas are associated with joy and beauty. In Indian music, different ragas are presented at different points of time in a day. Ragas effect also depends on the time of presentation. Ragas such as Bhairavi are for early morning (4–7 am), Madhuvanthi for afternoon (1–4 pm), and MaruBihaga for night (7–10 pm). Very few studies were carried out about the effect of ragas on neurodisorder cases with proper scientific base. Singh et al. used ten different ragas for ten different points of time on Cerebrovascular accident (CVA) and diffuse head injury cases. Singh et al. found faster recovery of cognitive functions in cases which underwent music therapy along with regular medical care. Music therapy given either passive or active way gives benefits to TBI patients in terms of reduction in anxiety and stress, facilitates breathing, improving attention, and emotional adjustment. Neurologic investigations pertaining to brain activity showed difference in activation of areas during positive and negative emotions. When music was given, parahippocampal areas (which are active during positive emotions) were more active than orbitofrontal areas (which are active during negative emotions). In the present study, vitals were measured to see the music effect. Pupillary response and motor activity were not changed; however, changes were seen in respiratory rate, heart rate, and SBP. Changes in these parameters were increased for some and decreased for some. Decreased values could be due to the calming effect of the music. Increased values could be due to arousal or alertness of the patients. Another reason for increased values could be the preference of music. Preferred music gives more positive effect, and unpreferred music can cause arousal, anxiety, etc.,, As the musical therapy was given for a short period, exact reasons for the decrease or increase in values cannot be said. This study needs to be carried out on large number of the study population with head injuries of all severities to know the Indian classical music therapy effect during the acute period. However, the results gave hope for positive findings such as decreased blood pressure and respiratory rate which indicate relaxed state. Gilbertson S. The silent epidemic of road traffic injury: What can music therapists do about it? Voices World Forum Music Ther 2008;8. Gilbertson S, Aldridge D. Music Therapy and Traumatic Brain Injury: A Light on a Dark Night. London: Jessica Kingsley Publishers; 2008. Guétin S, Soua B, Voiriot G, Picot MC, Hérisson C. The effect of music therapy on mood and anxiety-depression: An observational study in institutionalised patients with traumatic brain injury. Ann Phys Rehabil Med 2009;52:30-40. Hegde S. Music-based cognitive remediation therapy for patients with traumatic brain injury. Front Neurol 2014 24;5:34. Purdie H. Music therapy with adults who have traumatic brain injury and stroke. Br J Music Ther 1997;11:45-50. Scheel-Sailer A, Gilbertson S, Ochsner HM, Aldridge D. Music Therapy and Neurological Rehabilitation: Performing Health. London: Jessica Kingsley Publishers; 2005. Thaut MH, Gardiner JC, Holmberg D, Horwitz J, Kent L, Andrews G, et al. Neurologic music therapy improves executive function and emotional adjustment in traumatic brain injury rehabilitation. Ann N Y Acad Sci 2009;1169:406-16. Singh S, Chakraborty S, Jha K, Haider S, Chandra S. Repeated measure analysis in raga therapy: A case study on head injury patients. Res J Pharm Biol Chem Sci 2013;4:420-8. Singh SB, Chakraborty S, Jha KM, Chandra S, Prakash S. Impact of Hindustani ragas on visual acuity, spatial orientation, and cognitive functions in patients with cerebrovascular accident and diffuse head injury. Music Med 2013;5:67-75. Barksdale AL. Music Therapy and Leisure for Persons with Disabilities. Champaign, Illinois: Sagamore Publishing; 2003. Wikipedia. Hindolam; 2017. Available from: https://en.wikipedia.org/wiki/Hindolam. [Last updated on 2017 Jun 21]. Wikipedia. Hanumatodi; 2017. Available from: https://en.wikipedia.org/wiki/Hanumatodi. [Last updated on 2017 Jun 21]. Wikipedia. Kalyani (Raga); 2017. Available from: https://en.wikipedia.org/wiki/Kalyani_(raga). [Last updated on 2017 Jun 21]. Ayurveda – Influence of Music on Health. Available from: http://www.ayurveda-foryou.com/music/music.html. [Last updated on 2017 May 13]. Koelsch S. A neuroscientific perspective on music therapy. Ann N Y Acad Sci 2009;1169:374-84. Kleinstauber M, Gurr B. Music in brain injury rehabilitation. J Cogn Rehabil 2006;24:4-14. Jiang J, Rickson D, Jiang C. The mechanism of music for reducing psychological stress: Music preference as a mediator. Arts Psychotherapy 2016;48:62-8. Jiang J, Zhou L, Rickson D, Jiang C. The effects of sedative and stimulative music on stress reduction depend on music preference. Arts Psychother 2013;40:201-5.